Product headline The flowmeter with automatic frequency scan for maximum measuring performance and cost-effective transmitter. Clamp-on flow measurement of process water, saltwater, deminerialized water, drinking water and wastewater. Sensor features Low capital investment – cost-effectiveness increases with pipe diameter (up to DN 4000). No additional leakage paths – external measurement from outside the pipe. Process transparency – diagnostic capability. Medium temperature: –20 to +80 °C (-4 to +176 °F). Degree of protection IP68 (Type 6P enclosure) for pipes under water. 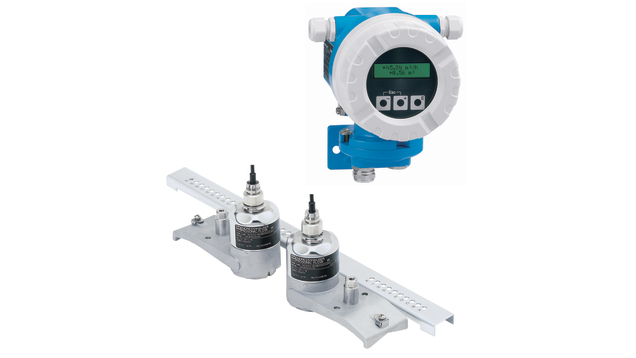 Transmitter features Economical transmitter – designed for easy applications. Fast and reliable commissioning – Quick Setup menu for installation. Automatic recovery of data for servicing. Aluminium field transmitter housing. 2-line display with push buttons.